FLASH 54 is a 36x15 RGBW high power LED wash. It has a solid structure with an IP rating of 65. Each LED line can be controlled separately which brings out a homogeneous and bright color mixing effect. Its powerful light gives it a high projection ability which makes this fixture perfect for any indoor or outdoor application. FLASH 55 is a 720x0.2 watts RGB + 720x0.2 watts White LED wash. It is divided into 8 zones each controlled separately which brings out a homogeneous and bright color mixing effect. Its powerful light, solid structure and IP65 rating makes this fixture perfect for any indoor or outdoor application. FLASH 54-Z has a zoom controlled feature with 36x15 watts RGBW LEDs as main light source and 72x0.2 watts RGB LEDs as backlight. Each LED line is controlled separately which gives it a wide variation of color mixing and effects. Its IP65 rating and solid structure makes this fixture perfect for any indoor or outdoor applications. CPX 4120 is an extremely bright LED-based RGBW fixture. It is powerful enough to illuminate large architectural facades or canvas, entire stage areas, and arenas. 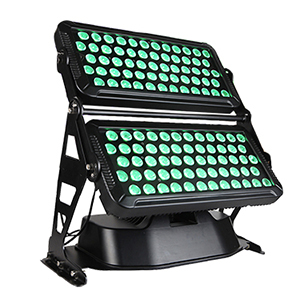 It utilizes the extremes of cutting-edge LED technology and its rugged design allows installation in any environment.